(Washington, DC, April 27, 2016) – More than 4,820 workers were killed on the job in 2014, according to a new report by the AFL-CIO. Additionally an estimated 50,000-60,000 died from occupational diseases, resulting in a daily loss of nearly 150 workers from preventable workplace injuries and illnesses. The report calls attention to an increase in fatalities among older workers. The states with the highest fatality rates were Wyoming, North Dakota, Alaska, South Dakota and Mississippi. In 2014, 804 Latino workers lost their lives on the job and the fatality rate for Latino workers remains higher than the national rate. Workplace violence injuries, particularly among women workers in health care, is a serious problem. The workplace violence injury rate has increased by 60% over the past five years, while the overall job injury rate has declined. 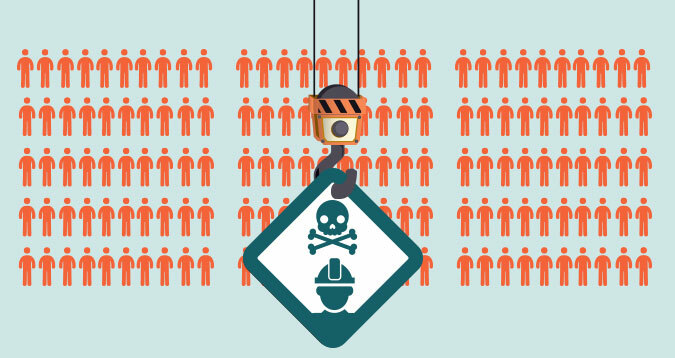 Oversight of job safety and health conditions remains weak and is getting worse in certain ways. OSHA can now inspect a workplace on average only once every 145 years, compared with once every 84 years in 1992, when the AFL-CIO issued its first report. The average penalty for serious violations last year was only $2,148 and the median penalty for worker deaths was only $7,000. “We have made important progress, including winning new OSHA silica standards to protect workers from deadly dust,” said AFL-CIO President Richard Trumka. “But as this report shows, too many employers are cutting corners and workers are paying the highest price. We must keep working for stronger laws and enforcement to hold employers accountable, until all working people are safe on the job.” said Trumka. Death on the Job: The Toll of Neglect is being released in conjunction withWorkers Memorial Day when vigils, rallies, and actions are being held across the country to remember workers killed and injured on the job. The report can be found online here: aflcio.org/death-on-the-job.